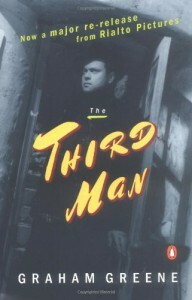 "The Third Man" is one of my favorite movies and Greene's novelization of his and Carol Reed's script does a pretty good job of transferring it to print. Of interest in this edition is Greene's introduction, where the reader learns, among other things, that the famous "cuckoo clock" line was Orson Welles' invention, and that Reed insisted on the film's ending rather than what Greene originally wrote (a decision that, in retrospect, Greene endorsed). As Greene admits, the book is an outgrowth of the movie as he couldn't write a script without first writing a story. As such, the movie is the more polished and satisfying product but that doesn't detract from the fact that The Third Man on its own is not a bad little thriller.